Rotherham United will entertain Stoke City this weekend in the SkyBet Championship. Neither side has had an exciting start to the season, sharing 18thand 19thspot respectively. Rotherham would have expected a shaky start as they will aim for survival come the end of the season. However, Gary Rowett has been a picture of frustration as his Stoke side have been far from expectations. Rotherham are the clear underdogs despite their home advantage and are priced at 5/2 by SkyBet. Goals have been scarce for the hosts with six goals. None of their attackers have taken the bull by the horns but most of the eyes will turn to Michael Smith for a goal. The striker netted once against Ipswich and hasn’t found the net since. He’s priced at 5/2 to turn his luck around and score anytime. Defensively The Millers have also struggled. They’ve conceded 14 goals already and conceded 2+ goals in 44% of their outings. Stoke are priced at 10/11 to score twice or more. The referee for this match will be David Webb. The official shouldn’t have too much trouble with this encounter. He has only awarded an average of 25 booking points in his 6 Championship matches. Stoke are priced at 11/10 by SkyBet – a great price for an accumulator. Gary Rowett has not had the desired effect on the squad as they currently sit 18thwith nine points from nine games. One of few shining sparks for The Potters has been Benik Afobe. The striker has already bagged for goals and has backed up his £12 million price tag. He’s priced at 7/2 to score first. Along with Afobe, Ryan Woods has been a fantastic acquisition that has fit right into the middle of the park. Woods has given the defence a little more stability. Stoke are 5/2 to win to nil, with the Woods effect being a crucial one. 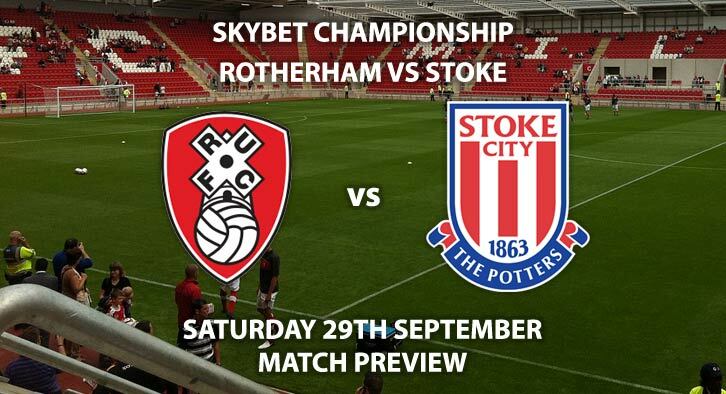 Rotherham United vs Stoke City will be televised on Sky Sports Football HD and kicks off at 17:30. – It’s about time Stoke showed their class. Rotherham will little to offer and could get found out defensively by Afobe. Correct Score – Stoke City 3-0 – (link no longer available). To Win to Nil – Stoke City – (link no longer available). Correct Score Group Betting – Stoke to win 1-0, 2-0 or 2-1 – 21/10. Scorecast – Benik Afobe to score first and Stoke to win 3-0 – 50/1. Odds and markets last updated on Saturday 29th September @12:00 GMT. Keep checking back to see if there’s any updates to markets – the time stamp in the previous sentence for when we update tips on this page will be updated.